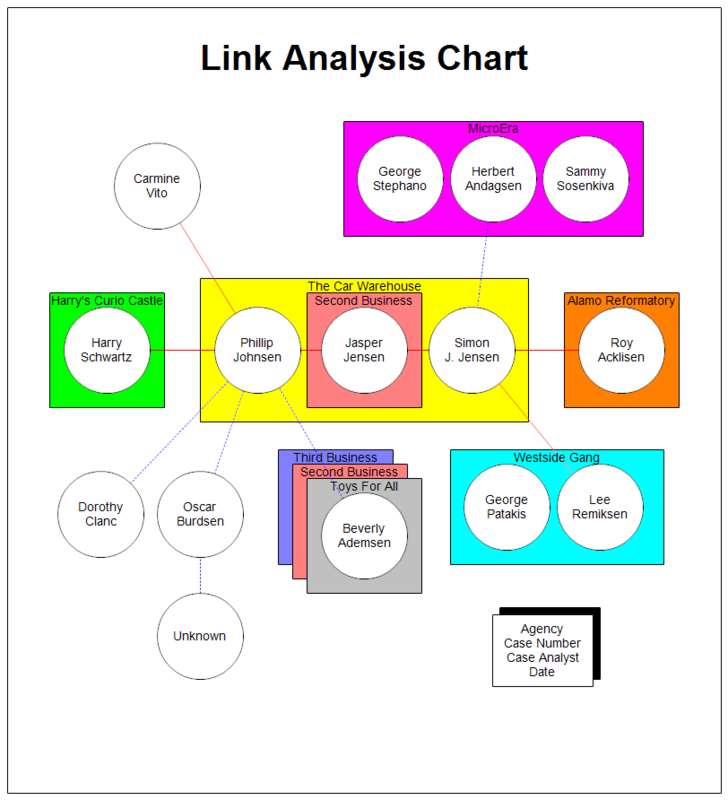 Description The diagram above is a link analysis chart that was automatically drawn using the RFFlow software. It shows a graphic representation of investigative data. People are shown as circles with the name in the center. You can also insert photographs into your RFFlow chart if they are available. Businesses are represented as rectangles with the key individuals inside the rectangle. Solid lines show confirmed associations while dotted lines show suspected associations. If you haven't already done so, first download the free trial version of RFFlow. It will allow you to open any chart and make modifications. Once RFFlow is installed, you can open the above chart in RFFlow by clicking on link_analysis_sample.flo. From there you can zoom in, edit, and print this sample chart. It is often easier to modify an existing chart than to draw it from scratch. To draw this chart without downloading or generating it from the data, run RFFlow and click on the More Shapes button. Scroll to the Criminal Analysis folder and click the plus sign to open it. Then click the Link Analysis stencil and click the Add Stencil button.